Sidi’s boots took some time to break in, but once they did, they were very comfortable. 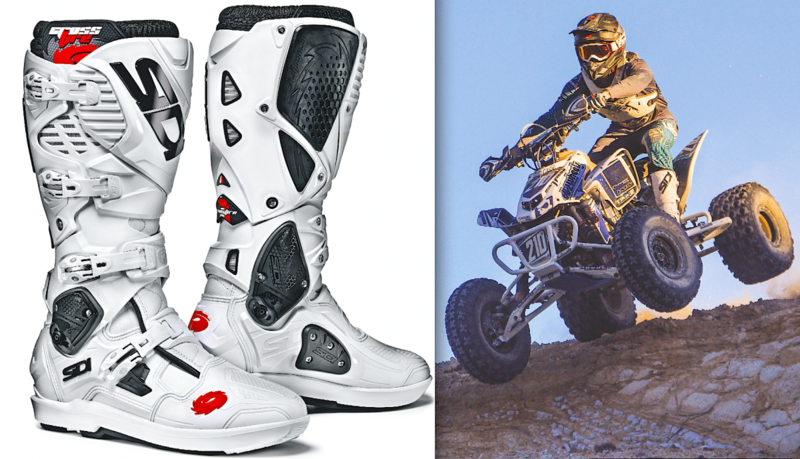 Convincing ATV riders to wear a motocross-style boot is a difficult task. 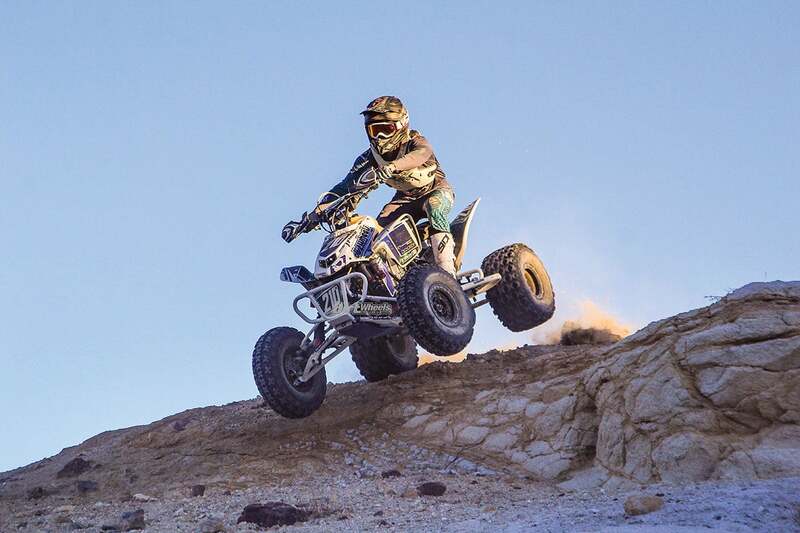 Most 4×4 riders wear shoes or work boots, and we see too much of that on sport quads as well. The riders that wear true moto-style boots are generally racers, or riders who like to ride as fast as they would racing. Just because your foot won’t hit the dirt as consistently as it would on a dirt bike doesn’t mean the protection and stability of a motocross boot isn’t worth it. Hard landings, the jerking and twisting motions involved in fast riding, crashes and more can be less damaging with good boots. Sidi shipped us a pair of its impressive Crossfire 3 SRS boots for a test. There is a lot of technology packed into these riding boots, and it shows when you ride with them. 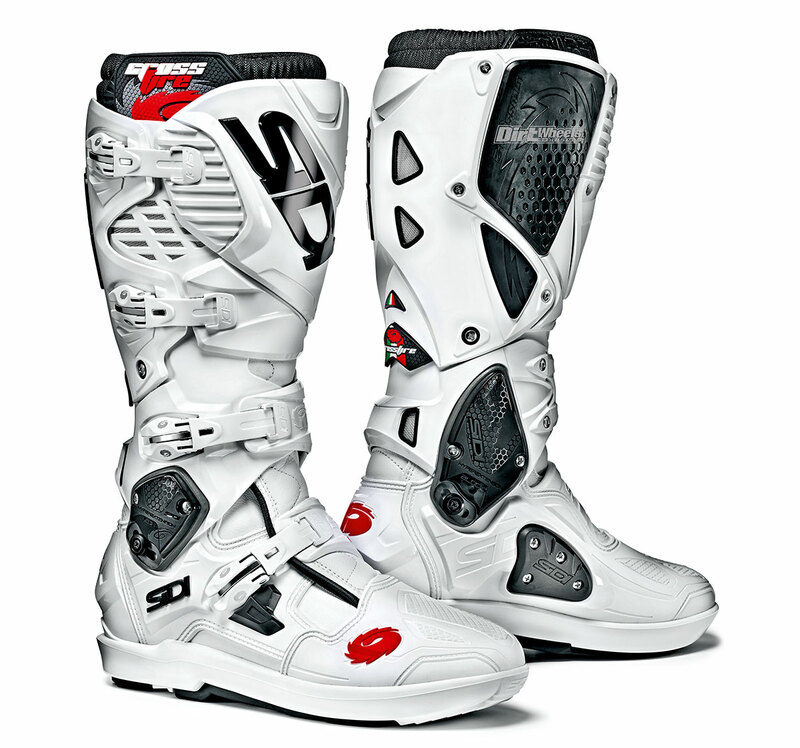 Sidi implemented a lot of technology to provide protection and ease of movement in this boot. Let’s start from the bottom and work our way up. The SRS dovetail boot sole can be easily changed out with an ordinary screwdriver. The toe area is covered with heavy-duty plastic, while the heel has a shock-resistant and anatomically shaped heel cup. The nylon inner sole has a removable arch support with replaceable metatarsus inserts. As we continue upwards, the buckle closure system is fully adjustable. The boot leg has no stitching, and it is replaceable. Sidi employed an outer-ankle hinge system that prevents hyperextension. There are four straps that buckle up the whole boot. After the ankle, the calf area of the boot can be adjusted to fit larger calves by widening the circumference of the boot. The shin plate is also replaceable. Sidi incorporated replaceable wear blocks that aid in gripping the sides of your machine. Finally, the inside of the boot is lined with Cambrelle and Air Teflon mesh. When you slip your foot into the boots, there are two inner Velcro closure systems that will help keep dirt and mud out of the inside of your boot. When we strapped into a set of the Crossfire 3 SRS boots, we were impressed with how well-made they are, and they are certainly easy on the eyes. This is when the first impressions come in, and it was a rocky start. These boots require a thorough break-in period with fine adjustments to become comfortable. The inside of the boots felt like they squeezed the foot until they were broken in. The straps are very adjustable, and the buckles are easy to operate. Once we got past the break-in procedures, the Crossfire became more comfortable as each hour of riding passed. We commend these boots on how protective they are. Some of us ride without nerf bars, and we catch rocks with our toes occasionally, and that was no issue for the Crossfires. The boots support your ankles and soak up impacts from hard landings far better than shoes or steel-toe boots could handle. The Crossfires are a top-of-the-line boot, and the price tag of $595.00 reflects that. If you are serious racer or simply ride fast and want a very protective and adjustable boot that becomes very comfortable and form-fitting, then this is a great option to go with. They come in multiple color options! Go to www.sidi.com to check out their full lineups of boots with quite a few less-expensive options to choose from!